Celina’s Makenna Klingshirn drives to the basket Wednesday night against Bryan’s Kennedy Lamberson during the first half at Leipsic High School in Leipsic. Celina’s Emily Braun loses her shot Wednesday night to Bryan’s Kennedy Lamberson during the first half at Leipsic High School in Leipsic. LEIPSIC – When it’s tournament time, a victory doesn’t have to be pretty. In Wednesday’s Division II girls sectional semifinal basketball game at Leipsic between Bryan and Celina – it was everything but a masterpiece. Despite shooting 30 percent from the field, Bryan pulled away from Celina early on and never looked back, en route to a convincing 42-15 victory over the Bulldogs. With the win, Bryan (15-8) will take on No. 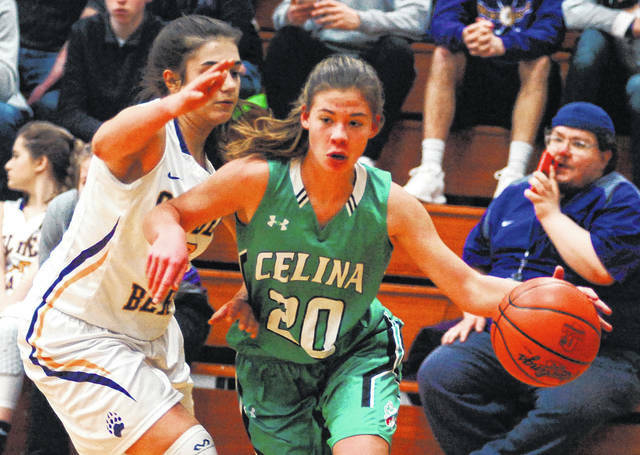 3 seed Napoleon Saturday in a sectional final at Leipsic, with tip-off set for 6 p.m. Celina ends the season 2-21. Celina turned the ball over 31 times on the night – one of the main reasons Bryan was able to overcome a subpar shooting performance. McKendry Semer and Kennedy Lamberson both scored nine points to lead Bryan. Teammate Allye Minor scored eight points and had five rebounds, three steals and two blocks. 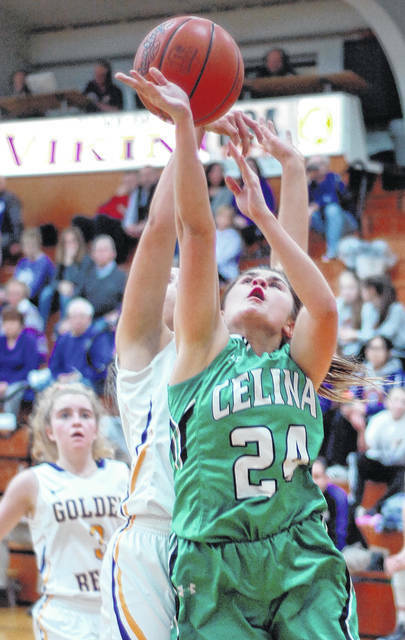 Eight players scored for Celina, with Carley Eichler scoring three points and making three steals. For the game, Celina shot a dismal 14 percent from the floor. Bryan jumped on Celina early, pulling out to a 12-2 advantage by the end of the first quarter. Celina struggled, making just 1 of 13 of its first-quarter field goal attempts. The Bulldogs turned it over eight times in the first eight minutes of action. The Golden Bears kept pushing the tempo in the second quarter, extending their lead to 19-4 within the first two minutes. A 3-pointer by Minor helped jump-start the Bryan spurt. The Golden Bears pushed their lead to 26-7 by the halftime break. Celina was just 3 of 20 shooting from the floor in the first half. Bryan’s lead ballooned to 36-12 by the third stop. The Bulldogs made just 1 of 8 from the floor in that third frame. On the night, Bryan dominated the boards, 39-26. Celina turned the ball over 18 times in the first half and 13 times in the final two quarters of action. https://www.limaohio.com/wp-content/uploads/sites/54/2018/02/web1_022118CelinaBryanBball03cardinal-1.jpgCelina’s Makenna Klingshirn drives to the basket Wednesday night against Bryan’s Kennedy Lamberson during the first half at Leipsic High School in Leipsic. https://www.limaohio.com/wp-content/uploads/sites/54/2018/02/web1_022118CelinaBryanBball05cardinal-1.jpgCelina’s Emily Braun loses her shot Wednesday night to Bryan’s Kennedy Lamberson during the first half at Leipsic High School in Leipsic.